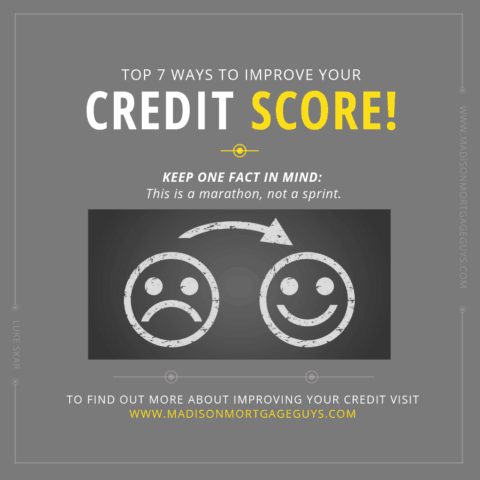 Top 7 Ways To Improve Your Credit Score: Proven Tips Inside! In the modern era where we have text messaging, food delivered within an hour, online bill paying and so many other seemingly instant responses, some things still take time. Preparing a quality meal takes time. Building a strong relationship with a spouse takes time. Improving a credit score can also take time. For some people, it may only take a few months while other people may have to work on their scores for at least a year. Regardless of your situation, the tips and strategies listed will apply to everyone and will help you improve your credit score. Please understand one thing; paying your bills on time each month is the single most important thing you can do to increase your credit scores. Depending on the credit bureau, there are 4 or 5 main items that determine everyone’s credit score. Of those items, your history of paying bills makes up about 35% of the score. THIS IS HUGE! Paying your bills on time shows lenders that you are responsible. It will also spare you from paying late fees whether it is a charge from a credit card or an added fee from your landlord. Use a calendar, or a phone app, or some other organized system to make sure that you pay your bills on time every single month. MAIN TIP: Do not pay ANY bill late! Another big factor in calculating a credit score is the amount of credit card debt. Credit bureaus look at two things when analyzing your credit cards. First, they look at your available credit limit. Second, they look at the existing balance on each card. From these two figures an available ratio is developed. As the ratio goes higher, so too will your credit score increase. In other words, the person is using 14% of their available credit and they have 86% available credit. The closer that ratio is to 100%, the better the credit score will be. In this particular example, if they had a problem with their car, or needed medical attention or some other emergency, the person would have the money necessary to handle the situation without incurring new debt. This is wise on the consumer’s part and lenders like to see this kind of money management. MAIN TIP: Keep all credit card balances as low as possible. The previous example showed a person that utilized just three credit cards. This is much better than someone who has 5+ credit cards, all with available balances. Why? Lenders do not like to see someone that has the potential to get too far in debt in a short amount of time. Some people have 5, 10 or more credit cards and they use many of them. This shows a lack of restraint and control. It is much better, and neater, to have only 2 or 3 cards with low rates that handle all of your transactions. A lower number of cards are easier to manage and it does not give a person the temptation to go on a huge shopping spree that could take years to payoff. MAIN TIP: Try to limit yourself to no more than 3 credit cards. People that have credit scores above 750 have a few things in common. First, they have credit for a few years. Second, they keep their credit balances low. Finally, they have different types of loans beyond credit cards. Having a mix of credit card loans, installment loans, and even student loans that are all paid on time shows the lender that you are a good risk. Installment loans are usually for large purchases such as a car, boat or a home. If you are in the process of improving your credit scores in hopes of buying a home, having an installment loan will help you greatly. It shows lenders that you can make a fixed payment, month after month, while also managing your other bills. Too many people make the mistake of paying off old debts, such as old credit cards, and then closing the account. This is actually a bad idea. A small part of the credit score is based on the length of time a person has had credit. If you have a couple of credit cards with a long track history of making payments on time and keeping the balance at a manageable level, it is a bad idea to close out the card. Similarly, if you have been paying on a car or motorcycle for a long time, do not be in a hurry to pay off the balance. Continue to make the payments like clockwork each month. An account that has a good record will help your scores. An account that has a good record and multiple years of use will have an even better impact on your score. MAIN TIP: Keep old accounts open if you have a good payment history with them. 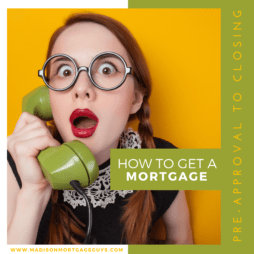 Too many people make the mistake of getting more credit after they are approved for a loan. 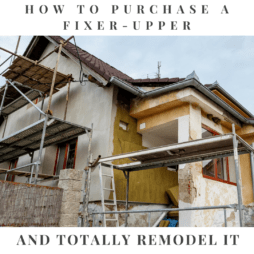 For example, if someone is approved for a new credit card, they feel good about their finances and decide to apply for credit with a local furniture store. If they get approved for the new furniture, they may decide to upgrade their car. This requires yet another loan. They are surprised to learn that their credit score has dropped and the interest rate on the new car loan will be much higher. What happened? 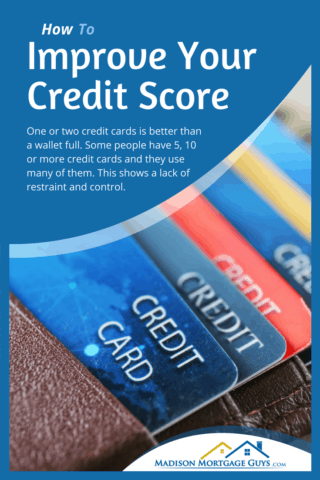 Multiple credit inquiries in a short amount of time can really hurt your credit scores. 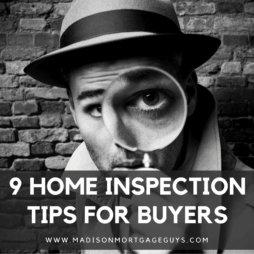 Lenders view the various inquiries as someone that is desperate and possibly on the verge of making a bad financial choice. If you currently have 2 or 3 credit cards along with either a car loan or a student loan, don’t apply for any more debt. Make sure the payments on your current debt are all up to date and focus on paying them all down. In a few months of making timely payments your scores should noticeably go up. This one tip will help you with nearly all the tips before it. A lot of people try to buy a home without a firm handle on their finances. This causes people to go in to debt when the roof needs replacing, or the water heater breaks or any number of other repairs occurs. The new debt, usually in the form of credit cards and small, unsecured loans, becomes a burden. Now the new homeowners are faced with trying to work more hours, get a 2nd job or risk losing their home. All of that can be avoided with a well-designed budget and a commitment to stick to a plan. Do some research online and find a good budget model that you can follow. Maybe you are the type of person to sit down at the beginning of the month and plan all of your payments based on due dates. Or maybe you prefer to do a little bit of work during the month to keep everything in line. Several online platforms can actually help you plan a budget based on your checking account history and help you stay on track with email reminders. This may seem a bit overwhelming, or even overkill. However, a well thought out plan can save you years of frustration and regret. MAIN TIP: Get your budget in order and stick to the plan. There are a few things that cannot be erased simply through wise spending habits. The 3 main credit bureaus are all made of people doing their best to get information right, but people do make mistakes. If you have items on your credit report that are factually wrong, you can dispute it on your own or hire a credit repair agent. 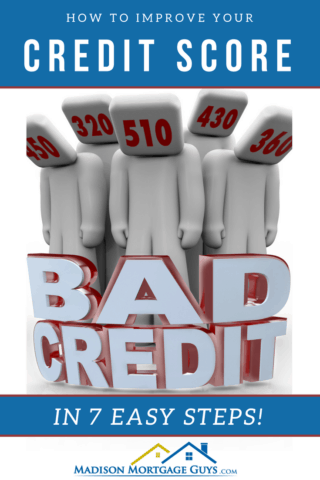 A credit repair company can provide you with a recent credit report. They can spot inaccuracies that commonly appear, and, most importantly, contact the 3 main bureaus on your behalf in order to clear up any mistakes. Please note: A credit repair company cannot erase any information on your report that is correct. For example, if you had a momentary lapse and forgot to make a credit card payment, that late payment will remain on the report. MAIN TIP: If you have proof that there are errors on your credit report, you can contact a credit repair agent for help. When reviewing all of these tips and applying them to your situation, keep one fact in mind. This is a marathon, not a sprint. It will take some time to improve your credit scores. Focus on the day-to-day activities you can do to improve your score and don’t worry everyday about the credit report. With a bit of discipline and hard work you will see that your situation is improving and you will be on the way to buying your first home!